Originally I had planned to do a tour of the tunnels under the wall in the afternoon, but Beth sent me a great link to tours in Berlin, so I changed plans and decided to go on the 4-hour "Discover Berlin" walking tour. Our tour guide, Rachel, was from LA and she sure sounded like a "valley girl", saying "right" at the end of almost every sentence. That aside, she was incredibly knowledgable and gave a fantastic tour. Instead of detailing each picture individually, here's a slideshow to enjoy. 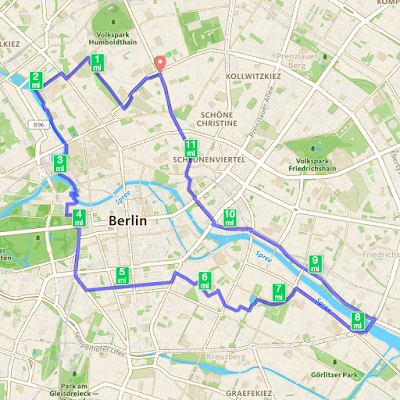 I'd highly recommend this tour to anyone that visits Berlin. I think the most revealing moment for me was when I learned that Berlin was fully contained within East Germany. I had always assumed, ignorantly, that the Berlin Wall divided West Germany from East Germany, when it actually only divided West Berlin from East Berlin. Am I the only one that made this assumption? Saturday night I had dinner with Elissa Fink and her family (she's Tableau's CMO and one of my favorite people in the World). Elissa's hotel was next to Brandenburg Gate, so I walked back from there, but before heading home, I was treated to this amazing view of the Gate and witnessed a marriage proposal. Young people these days! After a great night of sleep Saturday, I headed out for my Sunday long run. Knowing I was close to the Berlin Wall, I decided to create a route that followed the Wall most of the way. The first site along my run was the Reichstagsgebäude, which is home to the German Parliament. From there, I headed south and passed Brandenburg Gate. It looks quite different during the day. I then passed the Memorial to the Jews and Hitler's bunker, then as I headed towards Checkpoint Charlie, I passed the Abgeordnetenhaus Berlin, home to Berlin's State Parliament (not the German Parliament that I passed earlier; think of this as City Hall). Just down the road was Checkpoint Charlie and a mob of tourists I bypassed to snap a photo. The route then took me along the river, passing by St. Michael's Church. After heading down river for a bit, I crossed and made my way back to the AirBnB, passing what has to be the longest stretch of the Berlin Wall that remains. This section of the Wall is now more of an art gallery aimed at tourists. Honestly, it was so nice compared to the rest of the Wall I'd seen that I thought it was fake, so I didn't bother with any pictures. Later Sunday, I went on the "Under the Berlin Wall" tour, which while interesting, was terribly smelly and left me tired and with a headache. I nearly fell asleep several times during the tour. I enjoyed it, but would definitely recommend the Discover Berlin tour over this one, plus the Under the Berlin Wall tour doesn't allow pictures...boooooo!!! The night wrapped up with meeting some of my Tableau friends for a Vietnamese dinner washed down with a stupidly large gelato. Yum! I feel like I've barely scratched the surface of what Berlin has to offer. Knowing how cheap it is and the great historical experience it offers, this should definitely be on our list of places to bring the kids. I can hear the moans now!